1: Slough Town moved into the council-built Wexham Park in 1973, after previously playing at their old ground, The Dolphin Stadium. 2: The club's highest finish at the ground and indeed in their history came in the 1992/93 season when they finished 5th in the Conference. They were as high as 2nd for a lot of the year, but their form tailed off towards the end of the season. 3: Prior to joining the Conference in 1990, they played in the Isthmian League. Joining its second tier in 1973, the year they moved to Wexham Park, they earned an immediate promotion after finishing runners-up behind Dagenham. They never looked back, being crowned champions twice in 1981 and 1990. 4: Despite a decent 8th placed finish in the Conference in 1997/98, they were expelled from the Conference for having 49 too few seats, with the then board unwilling to fork out for ground improvements. How things might have been different if cheap metal stands had been around in those days. 5: The club have reached the FA Cup 2nd Round on a number of occasions. One of the most notable was when they played Orient in 1985. They drew 2-2 at the London club's Brisbane Road ground before bowing out in an exciting replay where they lost 2-0 at Wexham Park. 6: Slough have reached the FA Trophy semi-final twice. The most recent occasion was in 1998 when they lost out to Southport over 2 legs. 7: Notable players to play for the club include former Crystal Palace player Eric Young, Chelsea stalwart Micky Droy and Lloyd Owusu. The latter garnered the club's record transfer fee when he moved to Brentford for £25,000 in 1998. 8: Some famous names have also served on the management side. Brian McDermott was manager between 1996 and 1998 before going on to embark on a successful management career in the Football League. Current TalkSPORT presenter Alan Brazil was also at the club around the same time, with the former Scotland international serving as Director of Football. 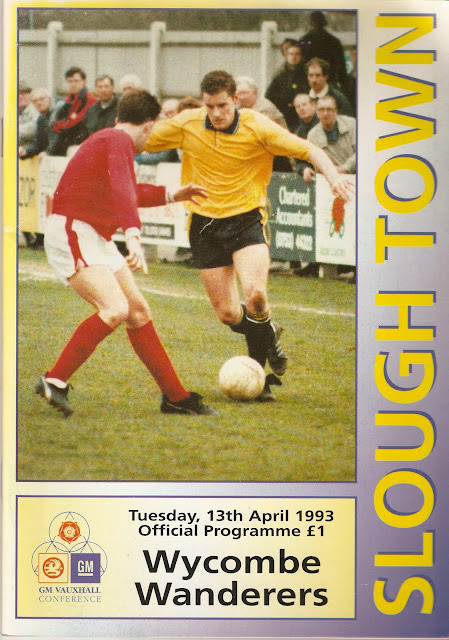 9: Slough Town left the ground in 2003 after a disagreement with the grounds owner Byron Thorne. He now earns nothing as the ground sits derelict and unused. 10: Since leaving Wexham Park, Slough have been a nomadic club - sharing at Windsor & Eton up until 2007 and then Beaconsfield SYCOB for the next 9 years. Happily they move into a new ground at Arbour Vale for the 2016/17 season, meaning they will play in their home town for the first time in 13 years. My first visit to Wexham Park was in the April of 1993. Wycombe's promotion was pretty much a formality by then, but local rivals Slough would be in with a slim chance if they managed to gain 3 points in this top of the table encounter. It was all pretty much academic as Wycombe drew 1-1 in front of a bumper crowd. At least all that wanted to got to see the game. In the earlier game that season, several fans were locked out, as Adams Park's 7200 capacity was not enough to cope with the masses. I travelled with my Dad and brother to see the game which had been made all-ticket a few weeks previously. Strangely enough the one thing I remember was my brother having a go at the linesman before the man with the flag turned tound and said 'bless you my son!' The man in charge was future World Cup referee Graham Poll, and Wycombe came into the game on patchy form, but had pretty much sewn up the league title prior to kick off. Tim Langford gave Wycombe the lead just after the hour mark, but the goal was soon equalised with an excellent 35-yard strike from Ian Hazel. Both sides had chances but some excellent saves from Slough's former Wycombe keeper Trevor Bunting kept things level. During Wycombe's first season in the league, my Dad would occasionally take me down to Slough to see them play as we always enjoyed watching Conference football. The first occasion was versus Halifax Town in the August of 1993. I remember we had my cousins over for the weekend as they were visiting from Kent. Slough easily won against Halifax 2-0 as the Yorkshiremen had 2 players sent off. Morrys Scott capped off an impressive performance with a goal, while Ian Hazel for the other for the Rebels in front of a crowd of 1,170. Ironically Halifax had replaced Wycombe in the Conference following their relegation from the Football League. Wycombe drew 1-1 up at Wigan Athletic on that day to continue their unbeaten start. The second time was a couple of weeks later, whilst Wycombe were up at Bury, still unbeaten and winning 2-1 on the day. Slough put in another great performance in front of 967 fans. Morrys Scott was again on the ball, scoring a brace. The other goal came from Neal Stanley - a player who had played for Wycombe back in the 1980's before I watched them. The one thing I remember though is Slough fans taking the mickey out of one of the Stafford players as he looked like Denzil from Only Fools & Horses! I'd have to wait another 6 years until my next pair of visits to Wexham Park. By now I was a bit older and had just passed my driving test, in fact I had only been a legal driver for 4 days on my first visit. Aldershot had a number of ex-Wycombe players who I was keen to see play again - one of them was cultured defender Terry Howard. He was famous for being sacked at half-time by Leyton Orient before joining Wycombe. He'd been released by us a few years earlier by idiot manager Alan Smith, though he'd let himself go in that time, sporting a huge gut. 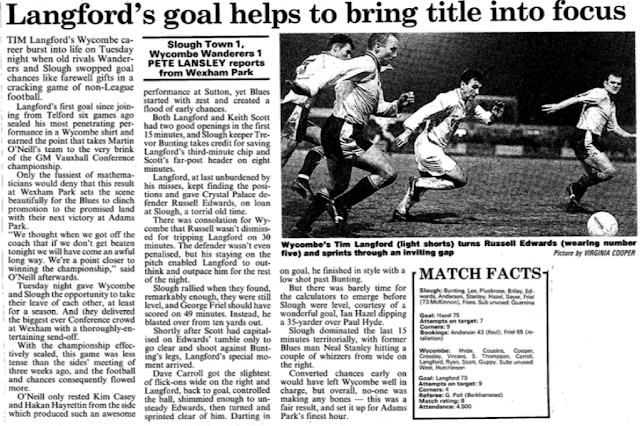 Slough had an ex-Wanderer too, though Paul Barrowcliff had only made a couple of substitute appearances for us. Both played their part in an entertaining 2-2 draw with Micky Engwell & Mark Hall scoring the goals for Slough. Aldershot bought a decent following, contributing to a crowd of 783 on a mild Tuesday night. My final visit came the following year when Slough played St Albans City. Wycombe were up at Preston but I had to be back for a family meal so I chose to go fairly local as I needed to get back. This time, the visitors coasted to a 3-0 win in front of 610 fans, the first away win I had seen at Wexham Park. I did attempt a further visit, a year or so later for a Berks & Bucks game against Wycombe. However I arrived at the ground to find that the game had been called off at 4pm - sadly the internet was not what it is now in terms of information and I didn't anticipate it being postponed with only light rain at home. By modern day Conference standards, WEXHAM PARK would have been one of the more basic grounds in the league, but back in the day, it was par for the course for the league. With a capacity of 5000 and cover for 2000 it was more than enough for their needs. The stand held 400 originally, all elevated above pitch level and with a good unobstructed view. 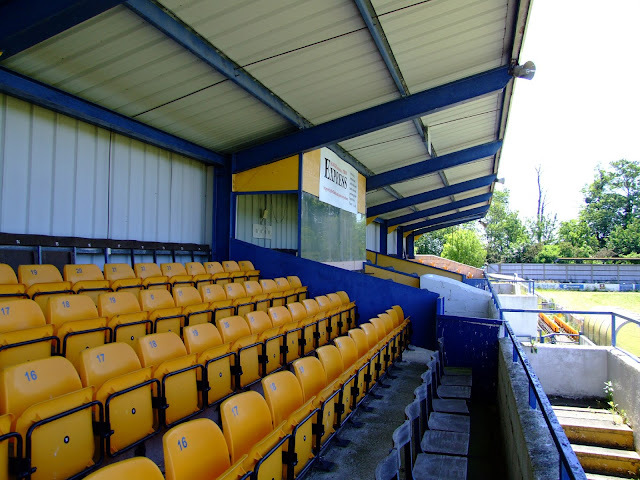 A further 50 seats were added at the front of the stand in the mid-1990's to comply with new ground grading regulations, though this was box-ticking more than anything. It was still not enough to prevent their relegation a couple of years later however, when the requirements went up again. The ground was pretty isolated, though there was a bar at the ground which was part of a wider sports facility including a driving range. Inside the ground, the tea bar was standard fare with the club shop being a good one with lots of old programmes. The toilet on the far side was unique in that you could watch the game out of the window whilst urinating due to a well placed window. These pictures were taken in 2004, shortly after the club moved out as I didn't have a digital camera on either of my matchday visits.